However, before we start to think about FHIR does CDA, let’s take a step back and think about the overall ‘patterns’ we use when moving Health Care data around – we can think of these as ‘paradigms of exchange’ (a term coined by Grahame Grieve I think). REST services, which have been the majority of what we’ve talked about thus far. These are useful for light-weight, real-time exchanges, and have become almost ubiquitous on the web for access to large, shared systems like Facebook, Twitter and Google. Messages. These are intended to ‘transfer state’ between applications – e.g. when a PAS (Patient Administration System) wishes to inform other applications within the enterprise that a patient has been admitted. Once the recipient system/s have been updated, then the message can be discarded (other than for audit purposes). Documents are intended to convey a summary at a point in time – generally a clinical summary. For example a Discharge Summary from a Hospital or a Referral from one provider to another. A Document is intended to be stored indefinitely. Other Services (which can be REST or SOAP) which are also real-time interactions (generally) but where there is more significant business logic that should be performed by the server (and we’ve talked about a few possibilities in the context of our XDS discussions). Persistence. A clinical document continues to exist in an unaltered state, for a time period defined by local and regulatory requirements. Stewardship. A clinical document is maintained by a person or organization entrusted with its care. Potential for authentication. A clinical document is an assemblage of information that is intended to be legally authenticated. Wholeness. Authentication of a clinical document applies to the whole and does not apply to portions of the document without the full context of the document. Human readability. A clinical document is human readable. There is a specific resource – the composition resource that contains the ‘header’ information about the document – quite similar in fact to the DocumentReference that we are already familiar with. The composition establishes the ‘context’ of the document – what, why, when and who. Ok, maybe there’s a bit more to be said…. 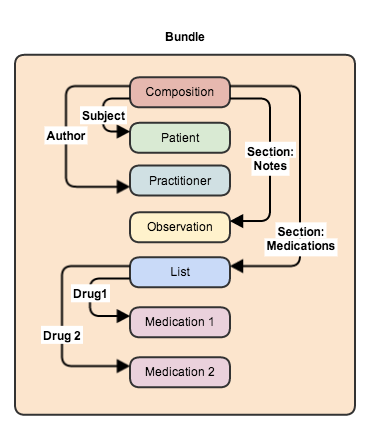 Another way to think of a FHIR document is that it is like an object graph, rooted in the composition resource, with all the resources linked together by the various resource references between them. And this visualization shows how the references that comprise the resources can either be located within the bundle, or stored remotely with a reference to it in the document – wherever makes sense. However, most times including them in the bundle is going to be the simplest way to represent a document, and it does make signing easier. The following diagram shows how you could have a simple document – maybe a clinical note and a list of medications. The document also contains the author and the patient (subject). The composition is the ‘starting point’ of the document. It is directly analogous to the CDA header. The ‘subject’ and ‘author properties of the composition point to a Patient and a Practitioner resource respectively. The ‘medications’ section points to a List resource, that in turn points to a couple of medication resources. (There’s actually a wee bit more complexity about medications – but that can wait for another post). The following diagram shows how the example would appear as a real XML document. The details of the composition resource – looks kind of important. What’s the difference between referencing an existing resource, and creating a new one in the document? And what if I want the server to store that new resource outside of the document (Like a new Condition)? How does the DocumentReference resource relate to this? How do you render the document text? How should I store a document? Are there recommendations for moving documents around? How can you extract resources from the document to update a local repository? Where do contained resources come into this? How do I update a document? What about CCDR (Consolidated CDA),CCD and CCR? How would you convert between CDA and FHIR documents? Will FHIR documents replace CDA, or is there another possible future? You write that messages “are intended to ‘transfer state’ between applications.” Well okay, but “state transfer” is exactly the purpose (and build into the acronym) of REST, too! In my view we should think of FHIR’s REST API as the default, simple, straightforward, well-understood way to transfer state. Messaging works well when you need to do more than a simple “update” – i.e. you need a more “tuned” service. REST is also typically real-time, while Messaging isn’t necessarily. Messaging allows more complex behaviors (e.g. update mode rather than snapshot). Messaging typically places more responsibility on the server than on the client in terms of what actually gets changed and how. Not exactly concise, but I think those are the main differences. If it can’t be easily defined perhaps it’s time to abandon the messaging paradigm. FHIR and messaging is really only one for the completists. I would also ditch the services paradigm. The resources paradigm, with documents as a complex resource, are where the efforts should be focussed – and that seems to be what’s happening. Thanks for this helpful overview post David. I am looking at it more from an implementer’s eye. The FHIR example and the analogies to CDA described in the article are helpful. It would be helpful to see what would be the equivalent CDA document from this FHIR resource representation. Also I see that there’s a wide range of tools for validation both for FHIR and CDA. I am keen to implement automated mappers between the two formats. I see the validation business rule as an inverse transform of the mapping process that a translator block in a ESB has to implement. What do you think are the challenges to this? Why are there no mapping tools available that can take advantage of the schema+schematron validation rules in both the FHIR and CDA representations and convert between these two formats seamlessly. For example, the AU NEHTA CDA has these schematron validators defined for the Diagnostic_Imaging_Report CDA (https://www.digitalhealth.gov.au/implementation-resources/ehealth-reference-platform/clinical-documents-integration-toolkit). I think there are schematron validators for FHIR as well (not for this particular document type maybe).